A slew of films are having their world premieres at Austin’s SXSW Film Festival this year, but only one could be chosen to open the Festival up this past Friday evening. Duncan Jones’ Source Code— starring Jake Gyllenhaal, Jeffrey Wright, and Vera Farmiga– was granted that honor, and everyone in the audience was curious to see if Jones (whose first film, Moon, marked one helluva debut for this sci-fi-friendly director when it played SXSW two years ago) was going to deliver. So, was Source Code as good as Moon? Did it live up to the hype? Is Jones as on-point directing someone else’s script as he is when he’s directing something he’s written? Find out after the break. Science-fiction fans were thrilled to death with Duncan Jones’ Moon, the Sam Rockwell-starring, moon-based epic that arrived back in 2009. That film featured a tour de force performance from Rockwell, an incredibly clever script co-written by Jones and Nathan Parker, and served as one of the best debuts from a film director that we’d seen in a long, long time. It also premiered here in Austin at that year’s SXSW Film Festival, so when Jones took the stage Friday evening to share Source Code with a packed audience at the Paramount Theater, expectations were running high. The crowd was not disappointed. On the whole, Source Code is a well-crafted, thoughtful, thrilling sci-fi actioner. There’s no way any film geek worth his salt will tell you that it’s better than Moon, though: pound for pound, Jones’ first film mops the floor with Source Code‘s script, its performances (despite an admirable lead performance from Gyllenhaal), and– most importantly– its ending. 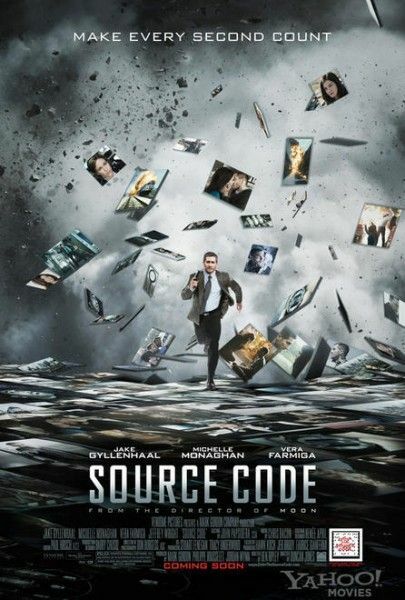 In fact, I suspect that Source Code‘s final fifteen minutes are going to be the sticking point for most viewers: either you’re going to go along with it or you’re not, but in either case you’re going to be entertained all the way up until that point. In other words, you should definitely see Source Code when it arrives in a few weeks, but you should prepare yourself for the possibility that you won’t love it unconditionally. For me, the logic surrounding the film’s ending is more than a minor quibble. Without spoiling anything, I’ll say this: either I didn’t understand something very important about Source Code‘s plot… or the film’s got a massive, Austin-sized plot-hole in its final moments. I’m going to have to see the film again to know for sure, but right now I can’t help but lean towards the latter. And if that’s the case, well, it didn’t ruin the film for me, and Jones can’t be faulted completely: he didn’t have a hand in this script, which was written by Ben Ripley. It should be telling that I’m unwilling to write off the film entirely even though I think the ending’s got some serious logistical issues: the rest of it’s that good. Jake Gyllenhaal plays a helicopter pilot who goes down on the field of battle in Afghanistan, only to wake up aboard a commuter train outside of Chicago. When he comes to, he’s understandably disoriented: the other train passengers seem to know him, he’s in mid-conversation with the woman sitting across from him, and– most troubling of all– when he looks in the mirror, he sees another man’s face. In short order (eight minutes, to be precise), the train Gyllenhaal’s on explodes, killing everyone aboard…including him. He comes to inside a “pod” of some sort, strapped into a chair and staring at a handful of TV monitors. On one of the monitors, he can see a scientist played by Vera Farmiga, an Army captain who’s being fed orders by another shadowy scientist-type played by Jeffrey Wright. He learns that he’s part of some kind of experiment, one in which he’s being forced to relive the same eight-minute stretch over and over again in an effort to stop the train from exploding. To say anything further about Gyllenhaal’s mission might risk spoiling plot details, and since I’ve already promised you that I wouldn’t do that, I’ll have to leave the rest of the plot for you to discover. Rest assured that almost everything’s explained over the course of the film (which runs a mercifully brisk 95 minutes-or-so: “mercifully” because seeing Gyllenhaal relive the same eight-minute stetch over and over again starts to get tedious very quickly), and rest assured that the film has more than a few plot twists up its sleeve. As you’ve probably already heard, Source Code combines elements of Groundhog Day, Quantum Leap (there are a few very clever nods to that series in here: keep an eye out for ’em), and just about every other time-travel film you can name into a very effective package. Though we’ve seen a lot of these elements before, Jones manages to make them feel fresh and compelling all over again. It helps that his cast is so effective, but mostly it’s Jones’ sense of pacing and his instinct for when to focus on the character-driven moments rather than the more outlandish sci-fi aspects of the story. For a dude that had only directed one feature film prior to this, he comes off like a pro. Time-travel stories are a lot harder to pull off on-screen than you might think (just look at Joseph Kahn’s Detention, which also premiered here at SXSW to plenty of dumbfounded, non-plussed audience members), but Jones makes it look simple. Everyone involved– from Gyllenhaal to Farmiga to Jeffrey Wright and Michelle Monaghan, who also stars in the film– turns in great work, and Jones shows that he can handle big, loud action scenes just as well as he was able to handle all of Moon‘s quiet, character-driven moments. After seeing Source Code, I have no doubt that Jones has a long, fun career ahead of him in Hollywood, and I can’t wait to see what he does next. That said, I hope that Jones’ next outing involves a script that he’s written, rather than him adapting someone else’s material to his vision. As I’ve already indicated, the problems I did have with the film rest entirely within the confines of Ben Ripley’s script. Unfortunately, I can’t really get into what I didn’t like (read: didn’t completely understand…or understood completely and believe to be absurd) without revealing some massive spoilers, but I’ll say this: it’ll be interesting to see how audiences react to the film, especially its resolution. I predict that we’ll see more than a few graphs, charts, and long-winded explanations designed to show just how “all that” was possible. This isn’t a Primer kind of situation, where the time travel aspects make the entire film difficult to understand, but there are a few key plot points in that ending that simply won’t add up for me until I’ve seen them explained in a convincing way. I’m very curious to see these explanations. It may turn out that I missed a vital piece of dialogue, or that there’s something very obvious here that I simply didn’t pick up on. But I’m a pretty sharp cat (it only took me three viewings to almost completely understand Primer), and I fear that it wasn’t that I didn’t “get” what the film was saying, but that the resolution is founded upon some questionable logic. We’ll have to wait and see. Maybe a second viewing will change my mind. I’ll be happy to give the film that second chance.